White sand in Galveston? That’s right, Palm Beach. Galveston’s favorite white sand beach will be opening to the public on May 21st! Relax under lush palm trees or take a dip in the cool waters of the popular lazy river or wave pool. With something for everyone, this summer will be loaded with fun and unforgettable memories! Come and enjoy the interactive 650-foot lazy river, wave pool and two 18-foot tower slides. Other attractions include beach volleyball on regulation courts and the Aquarium Adventure play area. 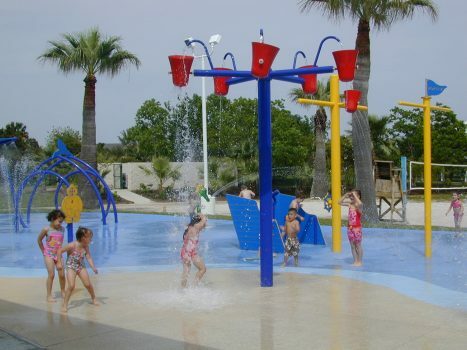 The Splashpad automated aquatic water feature offers interactive dump buckets, spray arches and fountains for a day of fun at the beach. Palm Beach admission is $23.95 for adults, $17.95 for children and seniors, or $55 for a season pass. Children ages three and under are free. As if this isn’t enough fun, we have exactly what you need for a weekend of island fun with the Bands on the Sand summer concert series. Beginning June 4, this live music series runs throughout the summer following each show with fireworks over the Moody Gardens pyramids and Offatts Bayou. Admission to each concert is $15 and free for kids three and under. Bands on the Sand will be held from 6 p.m. until 10 p.m. every Friday and Saturday through August 13. We’re glad to hear that you’re planning to visit! Senior Passes can be purchased online or at the door. Rates are dependent upon what attraction you’re planning to visit. If you’re planning to visit on a Tuesday, please be sure to take advantage of our Senior Tuesday discount! All Seniors receive a discounted rate of $5 per attraction, per person. Am interested in swimming ….. Seniors receive a discounted admission of $17.95 when visiting Palm Beach. You’ll be able to find more information at our Palm Beach website, http://www.moodygardens.com/attractions/palmbeach/. You’re welcome to purchase tickets online or at the door. Our white sand beach has everything from private cabanas to a lazy river and wave pool!